Introduction: It was evidently the custom of the retiring President of the Society of Telegraph Engineers in its early days to host a soirée or conversazione at the end of his one-year term. 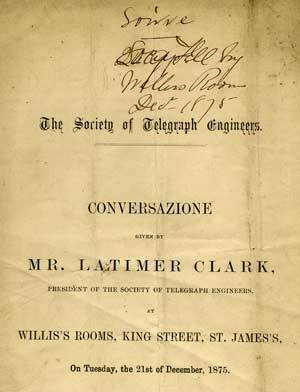 Latimer Clark was President of the Society in 1875, and his event included a great exhibition of historical telegraph and cable material. A report on the proceedings at the conversazione, describing just a few of the historic instruments, artifacts, and books on display, was published in the trade magazine Engineering in its issue of 24 December 1875; both this and the full text of the catalogue are reproduced below. See also the report of the 1876 event. “It is my pleasure to-night to have to propose to the Society a vote of thanks to our retiring President, Mr. Latimer Clark, for the uniform attention he has paid to his duties during the past year. As detailed at the start of the catalogue, a few rarities from Latimer Clark’s extensive library on the history of electricity and communications were exhibited at the conversazione. Clark died in 1899, and in 1901 his library was purchased by Schuyler Skaats Wheeler of New Jersey, who donated it to the American Institute of Electrical Engineers in New York, where it became known as the “Wheeler Gift Collection.” A two-volume catalogue of the collection was published in 1909, listing almost 6,000 items. Some of the Wheeler Gift Collection remains in Manhattan to this day, but sadly is languishing in the storage area of the Rare Book Division of the New York Public Library, uncatalogued for lack of funds and largely inaccessible. 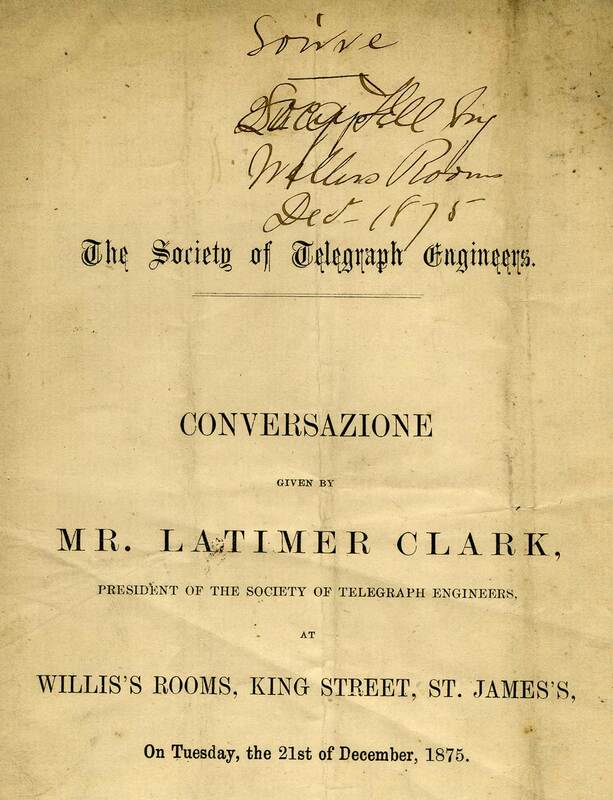 On Tuesday last a very successful conversazione was given by Mr. Latimer Clark, President of the Society of Telegraph Engineers, at Willis’s Rooms, where it was evident that no pains had been spared to bring together such instruments and specimens as must have been of the highest interest to the numerous visitors. Thus the President exhibited a valuable collection of old and very rare books, treating of electrical subjects, and ranging from the De Magnete of Petrus Peregrinus, 1558, down to the Catalogue of the Ronalds’ Library, in the handwriting of the late Sir Francis Ronalds, while one of the most interesting features of the conversazione was the Wheatstone collection, exhibited by Mr. Robert Sabine. Here we had a complete record of the intellectual labours of that fertile inventor and eminent savant, Sir Charles Wheatstone. Arranged in succession were the various modifications of the five, the four, the double, and the single needle telegraph. The most recent ABC instrument was close to its prototype the Revolving Disc Telegraph of 1840, while the gradual development of the automatic system might be carefully studied from the earliest comparatively uncouth-looking instruments to the marvels of ingenuity and speed that are now used over no less than 20,000 miles of wire. These three collections form, no doubt, the most complete that have ever been made. Another interesting exhibit was the “bridge,” an invention of 1840; and, as contrasts generally heighten the effect, this quasi venerable relic of our great electrician, was placed beside the earliest types of the rheostat, and these were succeeded by others, the last being a finished specimen with the most recent improvements. Another piece of apparatus, extremely ingenious in device, must have been welcome to every student of electricity; we mean the rotating mirror with which Sir Charles Wheatstone made his celebrated researches upon the velocity of electricity. There was yet another exhibit in this collection, which was typical of the conversazione, and which we must mention, as it closes the long list of the inventions which we owe to our late veteran electrician. This was a capillary mercurial receiver, which is said to be among the most delicate apparatus for signalling on submarine cables. It has been used with success over 2000 miles of wire. It was to perfect this instrument that Sir Charles Wheatstone went to Paris a few months ago; and he was actively engaged over it almost to the eve of his death. Among recent inventions, we noticed the Gramme machine, the Clamond generator, and Tisley’s dynamo-magneto machine. The former, a small model machine, was connected with Foucault’s apparatus, by which it is experimentally shown that if a copper disc be made to rotate between the poles of a powerful electro-magnet, heat is ultimately developed in the disc, and the temperature varies nearly as the velocity of rotation. The Clamond generator is a thermo-electric battery which may be very advantageously used for electrotyping, electric light, telegraphy, and various other purposes. This generator has already been described at length in our pages. Four batteries of one hundred elements each, and one of two hundred and sixty were exhibited. Besides these, in which gas is the prime agent in the production of the electric current, there was a large model of an apparatus arranged for burning coke. It consisted of two hundred elements. Two other classes of batteries deserve notice. The one was a miniature intensity battery consisting of twenty modified chloride of silver elements. This very compact little apparatus was exhibited by Messrs. Tisley and Spiller. The other was a large torpedo battery, belonging to the India-rubber and Gutta Percha Company. It had already done a fair amount of work, for it had been sunk in the Thames on September 24th, 1873, and taken up only in October, 1875. During this period it had been frequently used for testing fuzes and torpedoes. It is still in good working order. Of telegraph instruments and materials there were two numerous collections, by Messrs. Siemens Brothers and Mr. R.S. Culley, while Mr. G.E. Preece showed many specimens of cables injured by cable-borers, teredos, and barnacles. Among the curious applications of electricity illustrated at the conversazione, we may instance the apparatus of Mr. E. Gray, of Chicago, in which tuning-forks are so disposed that when the current is closed the forks are thrown into a state of vibration, and in this way sweet sounds may be sent along the wires to distant friends. Considerable attention was deservedly attracted by the experiments made during the evening by Mr. A. Apps, several of these experiments being among the most striking and beautiful within the vast range of electrical science. Nothing could surpass in richness of colour and softness of tint, his admirable combination of the fluorescent liquid and cascade experiment. An aurora tube 10 ft. long was lit up by an 18 in. induction coil, which, when connected with a large Leyden jar, gave the discharge a peculiarly snapping resonance. The diamagnetic property of copper was also shown, and many were very much amused with the time-honoured “poker” experiment. Mr. C.W. Cooke exhibited the original thunder house made by Dr. Priestly, and also an electrical gravity pendulum in which he endeavours to make the arc of vibration independent of the state of the battery. Mr. J. Browning had a fine array of microscopes, which were well patronised throughout the evening. The most interesting slide was the limnoria terebrans, the cable-borer. Another exhibit of Mr. Browning’s, though small in size, did not fail to become an object of minute critical examination. It was a model made to illustrate Professor Crook’s recent theory that the rotation of the earth may be accounted for by the rays of light impinging on its surface. Many, no doubt, as they took their eyes off this little radiometer, may have thought that they had been looking at a toy destined to open new fields to inquiry, perhaps even to effect a revolution in modern science. In conclusion, we may say that this conversazione was among the most interesting, as it was among the most numerously attended, at which we have had the pleasure of assisting. On Tuesday, the 21st of December, 1875. 1. Clark and Stansfield’s Gridiron Stage and Depositing Dock for Vessels. 2. PETRUS PEREGRINUS. De Magnete, &c. The earliest known book on the subject of Electricity or Magnetism. Augsburg. 1558. EXHIBITED BY. GEO. E. DERING, Esq. 3. THE NEWE ATTRACTIVE. By R. NORMAN. The earliest book published in England on the subject of Electricity or Magnetism. 1576. 4. Dr. GILBERT OF COLCHESTER. Be Magnete, &c. One of the earliest and most important works on Magnetism. 1600. 5. MARK RIDLEY. On Magnetical bodies, &c. An early work on Magnetism. 1613. 6. Wm. BARLOWE. Magneticall Advertisements. 1616. 7. NICOLAS CABEUS. Philosophia Magnetica, &c. 1629. 8. OTTO DE GUERICKE. Experimenta Nova. Amsterdam, 1672. 9. THE SCOTS MAGAZINE. Page 73. The first allusion to the Electric Telegraph. By Charles Marshall. Feb. 1753. 10. THOMAS MILNER. Experiments in Electricity. A scarce book, Containing the first description of Peltier’s Electrometer. 1783. 11. FRANCIS RONALDS. Description of an Electric Telegraph. One of the. most interesting books connected with the history of Telegraphy. 1823. 12. CERTIFICATE OF PROVISIONAL REGISTRATION OF THE ELECTRIC TELEGRAPH COMPANY. September 2nd, 1845. 13. Bust of the late Sir Francis Ronalds. 14. Deed of Gift of the Ronalds Library. 15. The Catalogue of the Ronalds Library, written by the late Sir Francis Ronalds. 16. A Collection of Books from the Ronalds Library. 17. A Portrait of the late Professor Samuel Morse, presented by Sir Charles Tilston Bright. 18. Volumes 1 to 3 of the Journal of the Society of Telegraph Engineers. These Exhibits exemplify the commencement and development of the Needle System. They commence with the original Five-Needle Telegraph, patented by Messrs. Cooke and Wheatstone in 1837, and first tried experimentally, and with success, on the 25th July, 1836, between the Euston and Camden Stations on the London and Birmingham Railway. A specimen of the conducting wire used on that occasion forms an Exhibit in connection with this instrument. A Five-Needle Telegraph is also shown which was used on the Paddington and Drayton Line, and is the very instrument which signalled the fact of a murder having been committed, leading to the immediate apprehension of Tawell. This instrument became celebrated owing to the murderer being dressed in the garb of a Quaker, and, there being no letter Q in the alphabet, the clerk had extreme difficulty in spelling the letter Q. This instrument was followed by the Four-Needle Telegraph, and almost immediately by the Double Needle, which was the instrument practically adopted by the Electric Telegraph Company in 1846, when it became incorporated after the purchase of the patents of Messrs. Cooke and Wheatstone. The Double-Needle, under the various dates of 1840, 1851, 1862, and of the latest date, is shown. The Single-Needle of the ancient type, and that form now used by the Post Office is also exhibited. 20. Wheatstone’s A. B. C. Telegraph. These Exhibits exemplify the gradual development and improvement of the first Alphabetical Telegraph patented by Wheatstone in 1840, and known as the “Revolving Disc Telegraph,” to the most modern form of the “A.B.C.,” which is capable of being used as an ordinary indicating Telegraph, and also as a Type-printing Instrument, both actuated by the same means of transmission. This group of instruments exhibits various forms of the same kind of instrument actuated by voltaic as well as by magnetic electricity. The latest type is that now extensively used by the Post Office. 21. The Wheatstone Automatic Telegraph. This collection of instruments represents the gradual development of the Automatic system of Telegraphy introduced by the late Sir Charles Wheatstone. It shows the various early types with their gradual improvements, until the completeness is arrived at in the set of apparatus now used by the Postal Telegraph System, over a mileage of 20,000 miles of wire. The exhibit of these three systems is the most unique and complete ever before brought together, and is obtained from the collection of the late Sir Charles Wheatstone, and from many specimens the property of the Post Office. 22. Wheatstone’s Bridge or Parallelogram, and Resistance Coils. The small board represents the original bridge constructed by Sir Charles Wheatstone, and which is now so widely known. Its description is contained in the Bakerian Lecture, delivered by him before the Royal Society in 1840. The circular set of resistance coils is of the same period. 23. The Bridge and Resistance Coils of that period are exhibited side by side with the similar apparatus of the modern form now in use by the Post Office. These clocks consist of astatic needles in a coil of wire, which are made to revolve by alternate second currents in revolving they drive the necessary wheel-work. The currents are produced from a motor, which has a pendulum with a coil for the “weight;” this passing over the pole of a permanent magnet has currents of an opposite kind induced in it, which pulsate regularly through the clock. 26. Wheatstone’s Magnetic Registering Thermometer. This instrument registers at a distance the temperature of any place where the apparatus may be fixed. 27. Wheatstone’s Capillary Mercurial Receiver for Signalling on Submarine Cables. This was the last invention upon which Sir Charles Wheatstone was engaged, and is believed to be the most delicate apparatus yet invented for this purpose. 28. A Portrait of the late Sir Charles Wheatstone. 29. Combination Pneumatic Valve as used at the General Post Office for the London Pneumatic system. 30. Specimen of Lead Pneumatic Tube after a service of twenty years. 31. Single-Needle Duplex Instruments, with Rheostats for exemplifying the working of the Duplex System. 32. Telegraph Pole, with specimens of Insulators now in use. 33. Specimen of Submarine Cables belonging to the Postal Telegraph system. 34. Case containing specimens of Faults and Accidents to Submarine Cables. 35. Specimens of Joints in Gutta-Percha Covered Wire used in Underground Telegraphs. 36. Specimens of Joints for Underground Wires made with Paraffin Wax. This instrument has been arranged to illustrate a discovery of Mr. Edison of New York. It is an adaptation of the Bain’s Printing Instrument. The stylus is tipped with tin and arranged with a spring exerting sufficient force to stay the progress of the chemically prepared paper as it is drawn forward by clockwork. The passage of an electric current decomposes the chemically prepared paper and at once destroys the friction. The stylus is drawn back under the pressure of the spring and is made to strike a bell. On the cessation of the current the friction of the paper again draws forward the stylus. Mr. W. H. Preece, M.I.C.E. 38. Gramme Magneto-Electric Machine with Jamin Magnet. The Gramme Machine is a successful attempt to obtain a uniform and continuous flow of electricity by means of the rotation of a peculiar armature between the poles of a magnet. This armature consists of a broad ring of iron around which insulated copper wire in separate coils is wound. The ends of these coils are connected to small insulated contact pieces fixed around the axle of the armature. Two springs press against these contact pieces to which the conducting wires are fixed. A magnet provided with soft iron armatures encircles closely the ring and coils. When the ring with its coils rotates, the position of the several coils is changing with respect to the magnet poles, and currents are induced in them the currents induced in the coils approaching a line drawn between the contact springs being of the reverse kind to the currents in those coils which are receding from it. There is consequently a stream of electricity flowing to the two springs. The direction of the stream depends upon the direction of the rotation of the armature and upon the way in which the coils are wound. In this experiment a disc of copper is made to rotate rapidly between the poles of a powerful electromagnet. When the magnet is excited, the disc, which formerly turned freely, meets with considerable opposition, and, if the rotation be persisted in, the disc becomes heated, The rise in the temperature, according to Foucault, varies directly as the square of the velocity of rotation. The original Thunder House, made by Dr. Priestly with his own hands. The principle of the gravity pendulum is an attempt to make the arc of vibration of the pendulum quite independent of the state of the battery. The pendulum makes connection every alternate second between the battery and a magnet, which magnet alternately lifts a brass ball, suspended by a silk thread, out of and drops it into a cup attached to the top of the pendulum rod. As the lever to which the ball is attached works between two adjustable stops the impact is always constant, no matter whether the exciting current be strong or weak. Pneumatic Bells for Houses, Mines, &c.
43. Case containing specimens of the French Atlantic Cable showing the various types. Case containing specimens of the different types of Cable manufactured by the Telegraph Construction and Maintenance Company. 44. A subdivided Condenser of 2, 1, 0.5, 0.25 microfarads capacity for Duplex Telegraph Working. 45. A subdivided Condenser of 10, 10, 5, 2, 2, 1, microfarads capacity. 46. A Condenser of 10 and 10 microfarads capacity. 48. Three specimen cases of Direct United States Cable. 56. Electro-Magnetic Engine, with rotating vacuum tubes, illuminated by a 4-inch spark Induction Coil. 57. Fluorescent Liquid and Cascade experiment combined, illuminated by a 10-inch spark Induction Coil. 58. Induction Coil giving 18-inch spark. 59. Aurora Tube, 10 feet long. India Rubber, Gutta Percha, and Telegraph Works Company. 60. Specimen of Submarine Cables. 64. Gray, Preece, and Radcliffe’s Patent Apparatus for Passenger and Guard Communication. This arrangement shows the plan of electric communication between passengers and guards, and also between guards and guards. It also combines a new method of couplings between carriages, and gives immediate notice of any break away. 65. Specimens of Raw and Manufactured India Rubber. 66. Specimens of Raw and Manufactured Gutta Percha. 67. Tisley’s Miniature Medical Battery (with modified De La Rue’s Chloride of Silver Elements). 69. A new form of Pocket Photometer. Mr. Alexander J. S. Adams. 70. Diagrams illustrative of Earth Currents. DIAGRAM I.-Upon ten wires radiating from London, simultaneous observations were made at intervals of fifteen minutes during the night, and the curves given by them indicate a maximum line of directive force from a little north of E.N.E. to slight south of W.S.W. ; and also that that line remained constant throughout the period of experiment. DIAGRAM II.—During the nights of January 7, 12, 14, and 16, and March 19 and 23, and also during the day of April 4, observations—as described above—were made, and the mean curves for these periods are here given. The mean of the total number of curves is also given, and demonstrates the constancy of the maximum line of directive force. DIAGRAM III.—Map of England, indicating the mean magnetic declination; and the line of maximum earth-current, with its direction. DIAGRAM IV.—Observations were taken upon six wires, extending from London to different points, for variations of dynamic force. The curves given show that such variations are, for all points, simultaneous for the same moment of time. DIAGRAM V.—This diagram gives the directive force curves for the night of the 18-19 March, accompanied by electric storm disturbances. It will be seen from this diagram that the maximum-line curves are but slightly influenced, whilst those observations made in directions right and left of that line, and in the region of weaker earth-currents, effects are considerably disordered. 75. Diagrams illustrating waste and economy of Magnetic Power.
" " Iron and Brass Separators. Mr. Thomas T.P. Bruce Warren. 83. Warren’s Patent India Rubber-covered Wire. 84. Specimens of Patent Vulcanized Oils. 85. Specimens of India Rubber from the Coir Tree of South America. This generator consists of bars of an alloy of zinc and antimony and plates of iron. The couples are arranged in a crown or circle, and connected in series; the crowns are superposed and insulated from each other by asbestos. The whole forms a cylinder, whose interior is lilted with asbestos, and heated by means of a clay tube perforated with holes. The mixed gas and air passing up the tube escapes through the holes, and is burnt in the annular spaces between it and the couples. The generator is used for electrotyping, electro-plating, and gilding, and for the production of light. A machine of 100 bars, with a consumption of eight to nine cubic feet of gas, deposits about one ounce of silver per hour. These instruments are used in connection with a central transmitter to record prices of stocks and shares, and of the various fluctuations of the markets. They print in Roman type and are much used. 88. Sewing Machine with Motor. 89. Geissler Tube, illuminated by a Thermo-Electric Pile. 90. Sprague’s Patent Universal Galvanometer. 91. One containing four circuits, having 1-10-100-1000-fold action on the indicator, and showing resistance from 0.1 to 10,000 ohms. 92. A similar instrument of different construction. 93. A galvanometer for powerful currents as in electro-plating, indicating on the dial the deposit of silver effected in ounces per hour. Mr. C. E. Spagnoletti, M.I.C.E. An improvement in Telegraph Instruments, which protects them from the effects of lightning. This shows the state of any signal to which it may be attached, every signal of the semaphore being repeated electrically to the signalman, who is then enabled to see the state of the working of a distant signal, and giving timely warning of anything wrong. 98. Grapnel for Submarine Cables, arranged for severing the Cable after being caught. 99. Specimen of Deep-sea Direct United States Cable, recovered from a depth of 2,240 fathoms. 100. The fracture of the Direct United States Cable off Newfoundland. Broken in September, and recovered on the 31st October, 1875. 101. Case containing a Joint in the French Atlantic Cable, showing the various stages of jointing the Conductor and Insulator. 102. A Joint made in the Gutta-percha covered Cable laid between Dover and Calais in 1850. 103. A specimen of the Dover and Calais Cable, recovered after a submersion of 25 years. Insulation being equal to 620 megohms at 60° Fah. Messrs. Warden, Muirhead, and Clark. 104. Apparatus for the Absolute Determination of the B.A. Unit of Electrical Resistance. Designed by PROFESSOR G.C. FOSTER, F.R.S. 105. Experiment to show the Retardation of Signals through Submarine Cables. Two mirror galvanometers, one at each end of a circuit of Muirhead’s inductive resistances, equivalent electrically to about 1,500 knots of cable. 106. Lippman’s Experiment, illustrating the Conversion of Mechanical Work directly into Electrical by varying the Surfaces of Contact of two Columns of Mercury with Acidulated Water. 107. Experiment showing the action of Light on Selenium. 108. Warden & Co.’s Patent Platinised Carbon Battery. Electromotive Force = 1.61 volts. Internal Resistance = .45 ohms. 109. Clark’s Double-Shunt Differential Galvanometer, with suspended Needles. 111. Warden & Co.’s Standard Condensers. 112. Saunders' Apparatus for protecting Cables in connection with Land Lines from Lightning. 113. Microscopes, illustrating various Specimens, including the limnoria terebrans, or cable borer. 111. Spectroscopes, illustrating the spectra of different metals. Messrs. O. and F.H. Varley. 115 Two Pairs of Iron Single-Needle Speaking Instruments, with improved transmitter, whereby the spring contacts cannot be subjected to undue strain, and greater reliability and durability of contact are ensured. 116. New Form of Double-Current Key, affording the same facility of manipulating as a Single-Current Key, and securing the alternation of reversals of currents with the smallest amount of movement, allowing more time for duration of contact. 117. One Ten-Way Universal Switch of one hundred changes. 118. A Pair of Wheatstone Bridges in a compact form. 119. Specimen of Gutta-percha Core from Norway, marked by the “limnoria terebrans,” or cable-borer. 120. Specimen of Core from the English Channel marked as above. 121. Specimen of the Atlantic and French Atlantic Cores marked as above. 122. Specimen of the Gutta-percha Core of the Persian Gulf Cable, the iron wires of which were in faulty condition, after being submerged in Kurrachee Harbour for ten months, penetrated by the “teredo,” or ship-worm. 123. Specimen of India-rubber Cable, iron wires of which were in bad condition, sub­merged April 1874, picked up February 1875, from Kurrachee Harbour; attacked in several places by borers, but insulation of the whole section perfect; in no case have the borers succeeded in penetrating the conductor. 124. Specimen of India-rubber Core, laid perfectly bare in shallow water in the Kurrachee Harbour for ten months. It is suggested that the injuries have been caused by marine animals tearing off the barnacles. 125. Specimen of India-rubber Core, submerged without any protection for ten months in the Kurrachee Harbour. Some of the barnacles have been removed to show the manner in which they gradually cut into the yielding rubber. 127. Method of Communicating Musical Tones by Electricity. 128. The Original Model of Ronalds' Dial Telegraph, 1816. 129. Repeater Contact piece actuated by a Semaphore Signal arm. 130. Condenser. 1 Microfarad capacity as designed by Major Malcolm, R.E, subdivided into 12 parts, to measure from 0.001 to 0.5. 131. Small Condenser, as designed by Major Malcolm, R.E., 0.1 microfarad capacity, subdivided into 4 parts, from 0.01 to 0.05. 132. Electrometer. A modification of Sir William Thomson’s Quadrant Electrometer. 133. Replenisher. For use with quadrant electrometer. 134. Platinum-Silver Resistance Coils, as designed by Major Mallock for use in India. 135. Hearson’s Patent Strophometer, for showing the number of revolutions per minute of machinery on a dial, and also registering the same on a strip of paper. Used also for applying to the paying-out gear of a cable-ship.